Subscribe to Rhythm and you can not only save money, but you'll also get ProMark and Joey Jordison gifts! 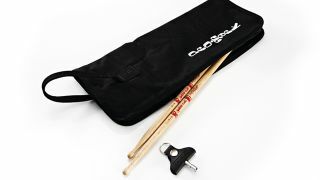 Get a free pair of Joey Jordison Oak Drumsticks, a stick bag, and a drum key keyring. These signature 16" Drumsticks designed by Slipknot drummer Joey Jordison, feature a classic 5A diameter, a slim neck for fast and precise rebound, and a full round bead for great articulation and projection. Made out of 100% Oak - the preferred wood for drumsticks - these make a perfect set of sticks for any Joey Jordison fan; especially since the "blood red ink" contains Joey's own blood! Coupled with a ProMark DSB4 Stick bag - which can easily hold all your sticks, brushes, and mallets - and a drum key keyring, this subscription offer is unmissable for any serious drummer. Subscribe to Rhythm to get your gift, save 20% off the cover price and never miss an issue again! Alternatively, to order by phone, please call 0844 848 2852 and quote offer code RHYW1L. Offer ends 30/06/13. This is a UK-only offer. However, drummers outside the UK can still make huge savings off the cover price: overseas subscriptions are available here.